A computer-generated image shows three satellites, part of the European Galileo navigation system network. The European Union has announced it will launch the first two satellites in its long-delayed and hugely over-budget Galileo navigation system from French Guiana on October 20. The European Union announced Monday it will launch the first two satellites in its long-delayed and hugely over-budget Galileo navigation system from French Guiana on October 20. EU industry commissioner Antonio Tajani said the launch, from the Kourou spacesport in the European enclave at the northern tip of South America, would take place at 7:00 am local time and the satellites would carry the names of Belgian and Bulgarian children. 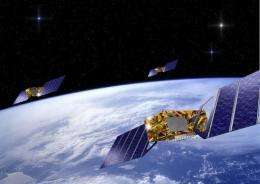 Intended to rival the US-built Global Positioning System (GPS) and Chinese and Russian projects, the Galileo programme's costs have risen to 5.4 billion euros ($7.2 billion). Scheduled to go online in 2014 -- six years later than originally planned -- it envisages an initial constellation of 18 satellites. Europe wants to end its dependence on the US GPS system in a market the European Commission has said would grow from 130 billion euros in 2010 to 240 billion euros in 2020.